Sound Transit’s board of directors voted Thursday to put a $54 billion expansion plan on the November ballot. It would add 62 miles of light rail with stations serving 37 new areas, growing the system to 116 miles between Tacoma, Seattle, Everett and the Eastside. Bold. Visionary. Historic. Courageous. Ambitious. Those were some of the adjectives Sound Transit board members used Thursday as they voted unanimously to put a massive expansion before Puget Sound voters on the November ballot. The plan is Sound Transit 3, a $54 billion, 25-year program to extend light rail and other services across the region using federal grants and three tax increases. It would add 62 miles of light rail with stations serving 37 new areas, growing the existing system to 116 miles between Tacoma, Seattle, Everett and the Eastside. • $54 billion for 62 miles of light-rail extensions, to create a 116-mile network serving a half-million daily passengers; Sounder commuter-train service, bus-rapid transit, park-and-ride spaces would be expanded. • Full build-out in 25 years. • An average household in urban Snohomish, King or Pierce counties would pay $400 more in yearly property, sales and car taxes, if voters in those areas agree to the measure in November. If voters in Snohomish, King and Pierce counties say yes to Sound Transit 3, an average household would pay $400 per year more in property, sales and car taxes. Sound Transit released a $50 billion draft plan in March, then added $4 billion in response to complaints about the timeline. That bump, made possible by new financial assumptions and strategies, would speed up by several years the construction of light-rail extensions to Everett, Federal Way, Redmond, Ballard and West Seattle. Seattle Mayor Ed Murray, who supports the plan, called November’s vote the region’s most significant since the Forward Thrust rapid-transit measure that failed in 1970, when Murray was in high school. Roughly two dozen wore red shirts with the slogan “Too much … traffic, time, taxes” and argued the light-rail extensions wouldn’t be cost-effective. They said Sound Transit 3 wouldn’t solve traffic congestion, would burden taxpayers with excessive increases, and that the financial details had not been fully vetted. Several said the region would be better served by Sound Transit prioritizing bus rapid-transit lines over additional light rail. Ubax Gardheere, political director for Puget Sound Sage, an advocacy nonprofit, provided a counterpoint. If Sound Transit 3 passes, her son will be able to take light rail from their home on the Eastside to the University of Washington for college, she said. “I’m really excited that I can afford to give him an ORCA card instead of a car,” she said. 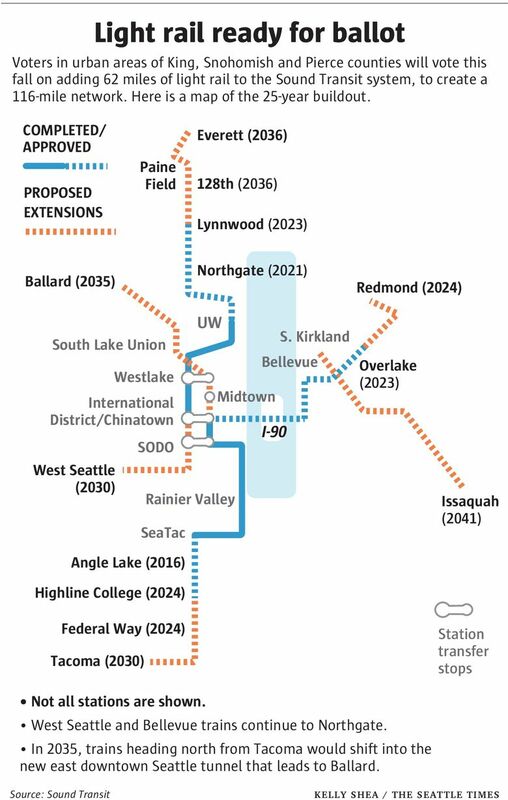 The sped-up plan calls for light rail to Ballard in 2035, West Seattle in 2030 and Federal Way to the Tacoma Dome in 2030, plus new stations for South Graham Street in Rainier Valley and South Boeing Access Road in Tukwila by 2031. Two light-rail stations, added this month in South Kirkland and on Northeast 130th Street, were also approved. Sound Transit 3 calls for an additional downtown Seattle transit tunnel, at a cost of $1.7 billion, and a drawbridge to Ballard rather than the Salmon Bay tunnelsome politicians and residents still want. Before voting, the board made a number of minor amendments. Those included directing Sound Transit to manage parking at light-rail stations and further the development of affordable housing on surplus land near stations.